As a whole, our family abstains from treats during Lent but since St. David's day fell on a Sunday this year, we decided to celebrate in a small way this patron saint of Wales. Husband's father's family is from Wales so we like to have fun with St. David even if we are many times removed from those ancestors. In the past, we have enjoyed a traditional Welsh treat called a bara brith which means "speckled bread". This year we opted for a Daffodil Cake, mentioned by Dawn in this post. 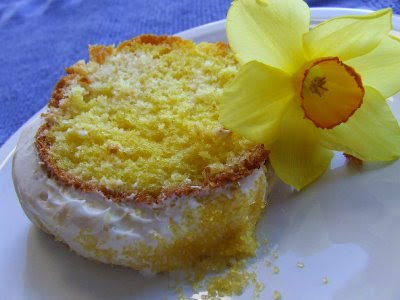 You knew I would be intrigued by the phrase "daffodil cake" didn't you? Oh, Dawn, I hope your cake was sunny and bright even if your weather wasn't! Being low on egg whites, we opted for a simpler version. I made a white cake but set aside about a cup and a half of batter, flavored it with lemon extract and mixed in some yellow food coloring. Then using a standard marbling technique, I swirled the dark yellow batter into the other batter already in the bundt pan. It is hard to see in the picture above, but the marbled affect was really striking. Simple cream cheese frosting topped it off. If you prefer to eat your leeks instead of wear them, like we do, you can head on over to Catholic Cuisine for some of our favorite leek recipes. Or check out Wikipedia for more information on celebrating St. David's Day. Doesn't the Church usually move the feast day when it falls on a Sunday so that it won't conflict? I don't see why you can't move St. David's Day in you domestic church in order to celebrate. I just might be making that Potato Leek Soup tomorrow since Husband is coming down with a cold tonight! Thanks! I hope you are enjoying some real sunshine and more daffodils than we are. That one in the picture was the only one left in my flower beds! The cake turned out absolutely beautiful!! Yummm!!! What a fun way to celebrate today! I have never made anything with leeks... I will have to pick some up and try out one of your recipes sometime! Thank you! Oh that cake looks so good, I think I might have to try it. Yummy, Charlotte! Your cake is so pretty!